Our healthy cabbage soup recipe is low carb and low calorie, so you can eat as much as you want. It's hearty and simple to make. 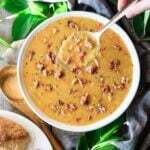 Enjoy this delicious homemade soup with ham. Whether you choose to make it on the stovetop or the crockpot, it will be a winner! Looking for a soup that is low in carbs and calories? This healthy cabbage soup covers all the bases and is loaded with flavorful vegetables and ham. It’s simple to make and tastes so amazing you’ll want to have seconds! Does cabbage detox the body? Cabbage’s diuretic properties rid the body of excess liquid, and the toxins that do with it. Since cabbage is sulfur-rich, it helps the liver break down toxins and can expel them easier. Stored in an airtight container, it should keep for up to 4 days in the fridge. In the freezer, it should keep for 2 to 3 months. How do you freeze cabbage soup? Cool the soup completely on the counter. Freeze in zip-top freezer bags laying flat or in another airtight container. When ready to use, thaw in fridge overnight, and reheat in a pot on the stove. For best flavor, brown the veggies first. Place the cooked veggies and all the other ingredients in the crockpot. Stir well. Gather all the ingredients. Chop the vegetables and the ham. Sauté the carrots and peppers in a large soup pot over medium high heat for 4 minutes. Add the onions and celery and cook for 3 minutes, stirring occasionally, then add the minced garlic and cook until fragrant. Sprinkle the dried spices on top of the sautéed vegetables. Cook the spices for one minute while stirring. Put the shredded cabbage, chopped ham, and tomato paste in the pot and mix well. Stir in the diced tomatoes and chicken broth. Cover and bring to a boil. Reduce heat to medium low and simmer for 45 minutes. Place the lid back on the pot and simmer for 15 minutes more. Garnish with freshly chopped parsley and some cracked black pepper. Serve hot with a homemade loaf of white mountain bread. Want more flavor? Brown the veggies first. Want the soup thicker? Add 3-4 tablespoons of tomato paste. Want to add more protein? Add kidney, cannellini or nor-western beans. Want to make this vegetarian? Omit the ham and swap out the chicken broth for vegetable stock. Want more carbs? Add brown rice, orzo, or potatoes. Want a different meat? Try hamburger, chicken, or sausage. Want additional vegetables? Try green beans, broccoli, or kale. Want a different garnish? Try a drizzle of sour cream. Need to lower the sodium? Omit the ham and use unsalted tomatoes and broth. Try our healthy cabbage soup; it’s the perfect soup to serve on a cloudy, rainy day. Liked this healthy cabbage soup recipe? You might be interested in these other soups with ham. Leftover Ham and Bean Soup: a nutritious soup packed with creamy broth, beans, and meat. Split Pea Soup with Ham: a hearty soup simmered with a ham bone for lots of flavor. Smoky Cheese, Potato and Ham Soup: a creamy blend of potatoes, amazing smoked gouda, and ham. If you made this healthy cabbage soup recipe, a pleasure of a 5 star review would be greatly appreciated. Our healthy cabbage soup recipe is low carb and low calorie, so you can eat as much as you want. It’s hearty and simple to make. Enjoy this delicious homemade soup with ham. Whether you choose to make it on the stovetop or the crockpot, it will be a winner! Heat the oil in a large Dutch oven over medium high heat. Saute the carrots and green pepper for 4 minutes, stirring occasionally. Add the chopped onions and celery and saute for another 3 minutes, then dump in the garlic and cook until fragrant. Add the spices, and cook for one minute stirring constantly. Mix in the cabbage, ham, and tomato paste, then stir in the diced tomatoes and the chicken broth. Cover and bring to a boil. Reduce the heat to medium low and simmer for 45 minutes. Taste and adjust seasonings, if necessary. Serve hot and garnish with chopped parsley and a few cracks of black pepper. The pleasure of a 5-star review of this healthy cabbage soup would be greatly appreciated. This soup was a delicious weekend treat! Packed with veggies, low in calories, and very flavorful. I substituted water for broth (compensated by adding extra spices), and omitted the ham and parsley. Looking forward to leftovers tonight! Thanks for making the cabbage soup! It definitely keeps well and tastes great as leftovers! You could have knocked a lot of carbs out of this recipe with the exclusion of the carrots. As is, 21 carbs per cup and a half is a lot. The other ingredients certainly signal a great tasty soup. Cheers! Thank you for your comment, Frank. We’re glad that you liked this soup! We use Nutrifox to calculate the nutrition facts for our recipes. If the soup is made without carrots, it only lowers the total carb count to 19.1g. 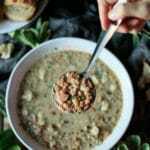 Since this soup contains a lot of fiber, that will raise the overall carb count.